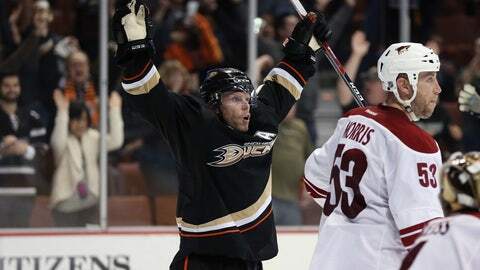 ANAHEIM, Calif. (AP) — Saku Koivu scored two goals, including the game-winner 51 seconds into overtime, to lift the Anaheim Ducks to their 10th straight victory, 3-2 over the Phoenix Coyotes on Saturday night. Anaheim improved its Pacific-Division leading record to 28-7-5 and went to 14-0-2 at Honda Center this season. The Ducks are the only team in the NHL this season not to lose at home in regulation. Andrew Cogliano gave the Ducks a 2-0 lead with his 11th goal of the season on a deflected shot in front early in the third period, with Koivu getting an assist. Martin Hanzal and Keith Yandle scored in the final five minutes of regulation to earn a point for the Coyotes, who have lost all four meetings with Anaheim this season. Hanzal cut the lead to 2-1 with 4:34 left after the puck caromed off the boards behind Jonas Hiller. With goalie Thomas Greiss pulled, Yandle scored the game-tying goal with 44 seconds left. Anaheim pulled seven points ahead of the second-place Los Angeles Kings, who lost to Nashville. Hiller stopped 23 shots and improved to 17-4-4. Anaheim has held its opponents to two or fewer goals in nine of the 10 victories during the streak. After yielding the first goal in each of its past five games, the Ducks got on the board first on a short-handed goal by Koivu in the first period. The veteran Finnish center skated into the Coyotes’ zone and blasted a slap shot from the left faceoff circle past Greiss. Greiss stopped 16 shots in the scoreless second period, including multiple Anaheim shots on two power play opportunities. Phoenix, which fell to San Jose on Friday in an overtime shootout at home, has dropped six of its past seven games. NOTES: The Ducks have traveled more than 28,000 miles in their league-leading 24 road games thus far this season. … Anaheim travels to San Jose to play Sunday, and will have an opportunity to extend its NHL-leading road winning streak to seven games. … Coyotes captain Shane Doan missed his 10th consecutive game with an illness. No timetable has been set for his return. … Entering Saturday’s game, Phoenix was 1-5 in its past six games with three of the losses coming in overtime shootouts.